In Sunday's New York Times there is an article The Fragile Paradise That Tahiti Used to Be by Jon Bowermaster. The premise is that the island of Tahiti has become too busy but paradise can be found on the Tuamotus, for now, before climatic changes make them uninhabitable. What struck me as interesting was the author saying "My preference though is to sleep on the beach, which is easily done in the Tuamotus, on any of a number of motus — mini-islands made of sand washed up on the rim of the coral reef. If you are after a glimpse of paradise, sleeping in these sands offers as close to a utopian experience as possible. 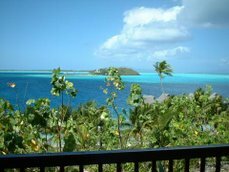 On Fakarava I chose a motu named Kiria on the far side of the lagoon from town. I hired a boat to drop me and made camp next to a hoa — a tidal stream running in from the sea — hanging a hammock between two coconut palms. In the mornings I would watch a squadron of frigate birds hover above the palms, floating on thermals. Beneath the hammock an army of sand crabs went about their various duties, leaving long, thin trails in the otherwise unadulterated sand. Gently pounding surf, broken by the thin coral reef crest, created a shallow aqua-blue swimming hole." However, in the Visitor Information section (which may have had a different author than the article) there was no information provided as to how you could hire a boat and camp out on Kiria motu. There was also no contact information provided for the "simple pension called Chez Matilde, with cabins to rent on the beach" where he stayed on Fakarava. I searched for it but could not find any information, though places in French Polynesia often have two names, Pension This and Chez Someone. I did find a new pension in Fakarava called, by coincidence, Pension Kiria. Just wanted to tell you how much I enjoy this blog and appreciate your effort and the fact that you're so willing to share your knowledge. Although I've traveled frequently to Hawaii, that's about where my polynesian experience ends. Tahiti has always been someplace I'd love to visit and I will someday. In the meantime, I'll be reading your blog regularly. I am so glad to be able to leave you a note, which I could not find a way to do on your two Palau websites, camping in the Rock Islands and camping on Kayangel. 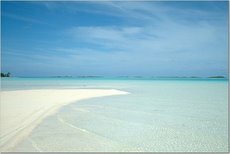 I happened to come across those two sites when I was looking for some links for a friend of mine who was asking me for advice about travel to Palau. In my letter back to her, I mentioned that the two things I would do if and when I went back to Palau, were self-kayaking and camping in the Rock Islands and also camping on Kayangel, the two things I regretted not being able to do on my trip to Palau two years ago (due to time restrictions). You are probably the kind of person who does not need comments in order to keep on providing such fantastic information, but in my experience, just a few words of appreciation make all the difference in the world. So I am glad to have the chance to simply tell you that I greatly appreciate what you wrote on the two Palau sites and I promise you that if I do go back to Palau to do those things, your information will be my Bible. Meanwhile, I see you have written here about Fakarava, where I went last year. Unfortunately, I do not know about camping on Fakarava, but if one wants to do the next best thing (maybe I would call it "camping in luxury", but at not a too overwhelming price for the luxury), let me introduce you to Pension Raimiti, that I think many of your readers would like to know about: www.raimiti.com A fantastic place designed by a true artist, as looking at the website will reveal. That's where I went last summer, and I truly loved it! Thank you so much for taking the time to write. It is much appreciated.